Press Ctrl+D to Bookmark or Subscriber us! Roboto is fully Responsive One Page WordPress Theme, it is built with Bootstrap 3 and includes lots of awesome features. It includes Premium Visual Composer page builder and Premium Layer slider. It is well documented and has 3 different demo content which you can use easily. Roboto is built with 2 different color variations dark and light which you can change it from Powerful Admin Panel with an ease. It has 2 different blog layout options, portfolio pages, testimonials, mailchimp ready and much more features. Great deal to buy for creative business agency, application and portfolio websites. 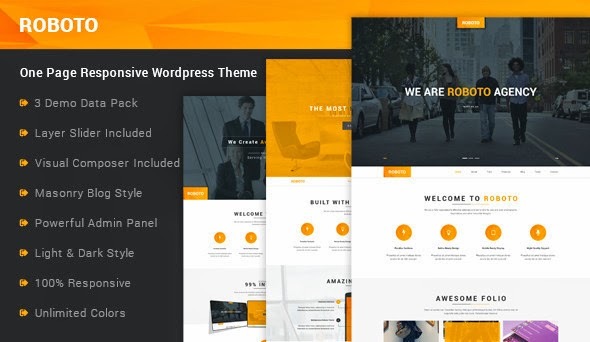 Item Reviewed: Roboto One Page Responsive WordPress Theme 9 out of 10 based on 10 ratings. 9 user reviews.
. Note: Some of the pages may contain Affiliate Links.